We at The Irish Cultural Centre have been reminiscing about all of the wonderful fundraising events and activities that our supporters undertook to fundraise for us! From jumping out of planes to busking around Ireland there are no limits to the creativity of our fundraisers! Starting with our Wear Your Heart for Irish Arts campaign to initially save the centre to now fundraising to complete the fit-out of our new purpose built centre, we are eternally grateful to all those who have helped and supported us; we couldn’t have done this without you! 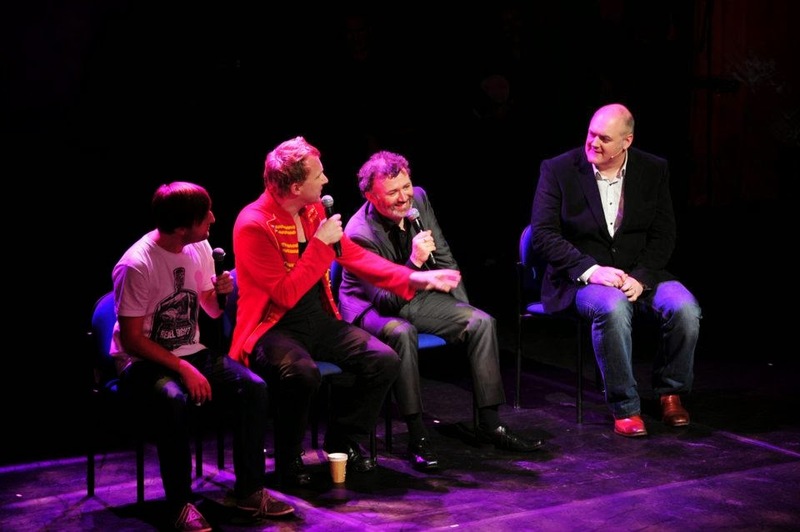 The lovely Dara O’Briain and Irish comedians Andrew Maxwell, Tommy Tiernan and Jason Byrne came together for night of laughs and great craic at The Palace Theatre in aid of The Irish Cultural Centre. The night kicked off with traditional Irish music filling The Palace and then dance troupe Hammerstep; an eight member group that mix traditional Irish step with tap and hip hop; took to the stage with their captivating and energetic moves. Dervish have been firm supporters of us, having held two gigs to fundraise for the ICC. Hailing from Ireland’s County Sligo, Dervish plays a sparkling brand of traditional Irish music filled with a freshness that holds proud and fast to its time-honored roots. Fronted by one of the finest traditional singers in Ireland today, Dervish features Cathy Jordan’s crystalline voice soaring above an intricate interplay of accordion, flute and fiddle. Dublin City Workingman’s Band played a benefit concert for the Irish Cultural Centre’s ‘Wear Your Heart for Irish Arts!’ campaign. 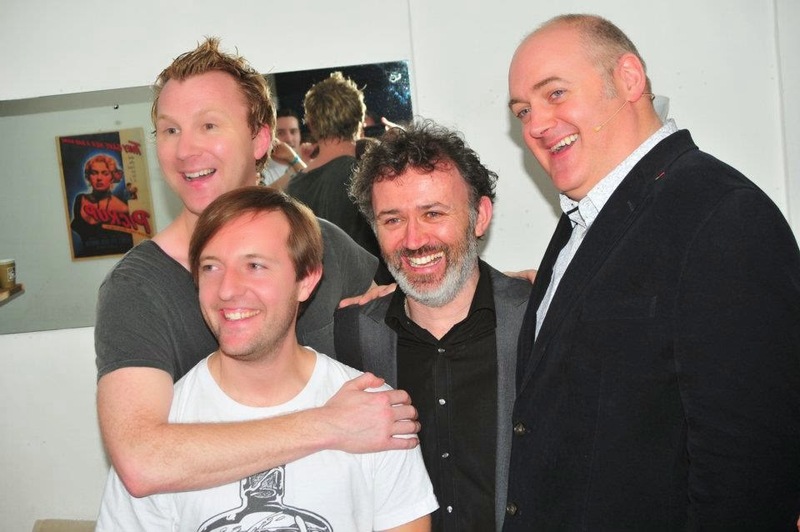 The band first got together in January 2003 when Ger (vocals/guitar), Ciarán (vocals/bodhrán) and Bob (vocals/guitar) met to sing a few ballads and have a few pints on a Monday night in the City of Dublin Workingmen’s Club on Wellington Quay. They were soon joined by J. Tingey on banjo and that summer started a Saturday night residency in the Chancery Inn. With a large repertoire of Irish ballads and their high energy delivery they soon became very busy on the Dublin tourist venue scene. 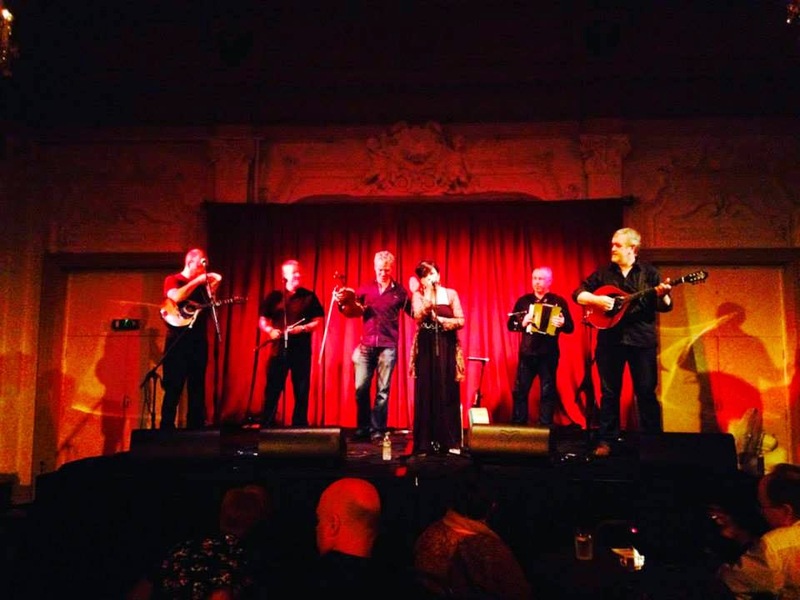 Danú kicked off their first UK tour in five years with a benefit for the Irish Cultural Centre’s ‘Wear Your Heart for Irish Arts’ campaign. Danú is a traditional Irish band that was founded in 1995 by Benny McCarthy, Donnnchadh Gough, Donal Clancy and Daire Bracken. 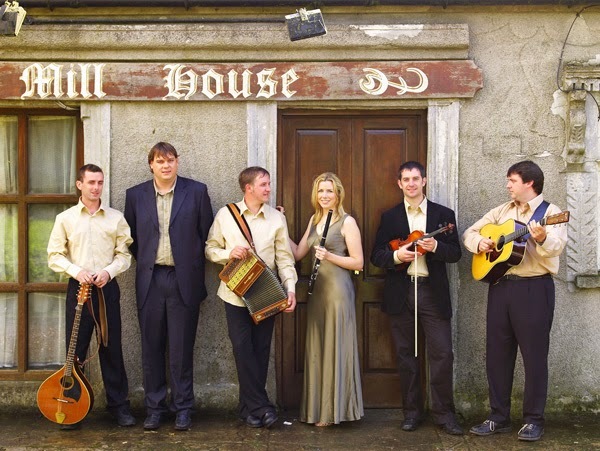 Now established as one of Ireland’s most important ensembles, Danú have gathered many awards and critical acclaim. 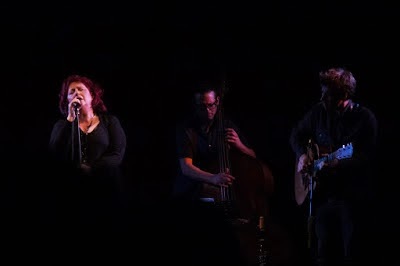 To coincide with the release of her album Alone, McEvoy embarked on a 16 date tour of the UK and played a gig for the ICC as part of this tour. One of Ireland’s most accomplished singer/songwriters, McEvoy’s life as a musician began at the age of four. To date, she has released albums on the Geffen and Columbia record labels and continues to tour the world over to her ever increasing legion of fans. The legendary Mary Coughlin performed for a rapt audience at Bush Hall in aid of the ICC. Performing songs from throughout her career and interspersing these with amusing anecdotes she had the audience in the palm of her hand. Chris O'Connor enjoying the 'flight'! 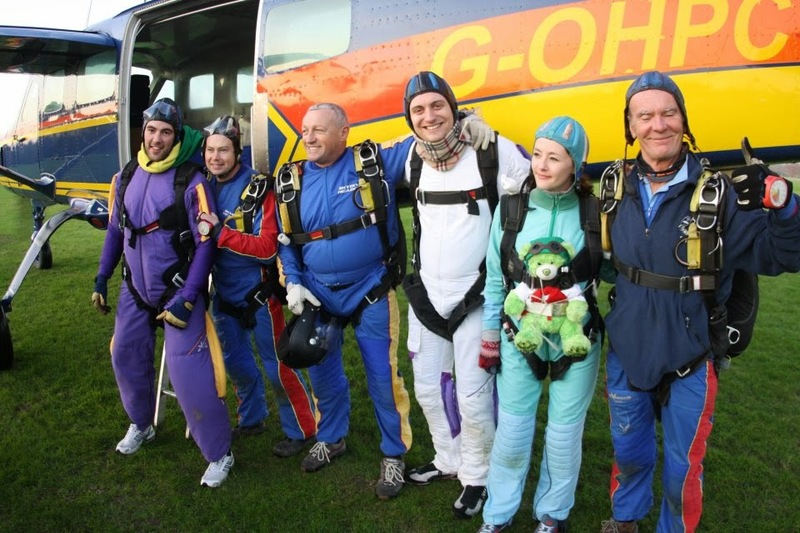 One staff member and two ICC supporters raised sponsorship to take on this death defying act…! General Manager Kelly O’Connor and ICC supporters Olly Nash and Chris O’Connor threw caution to the wind (quite literally!) and jumped out of a plane at 12,000 feet! Nerves were on edge and fingers were crossed for this brave trio as they conquered fear and raised money for The Irish Cultural Centre! Smiles and fear as Olly Nash parachutes for the ICC! "Despite being a man born without a head for heights the idea of Skydiving had always intrigued me, you could say it had always been on my bucket list. 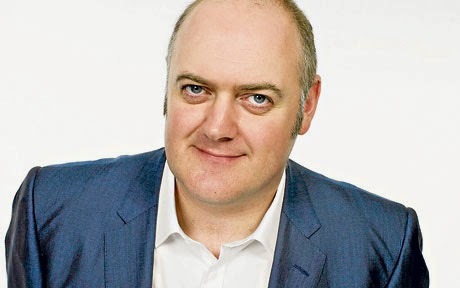 Then along came the ICC, Kelly O'Connor and the momentary lapse in concentration that saw me strapped to another man, legs dangling out the side of light aircraft over the patchwork quilt that is the Kent countryside. We were the last jump of the day and managed to get down just as the sun was setting. From such a height the whole experience was quite surreal – one moment we're in the aeroplane the next it's sky, ground, sky, ground, before you level out and the camera man catches up – a few moments of my best grinning buffoon impression before the parachute deploys. With a few short and rather sharp jolts we're at a pedestrian cruising speed, the wind noise has gone and the view was second to none, Simply breath taking. We were at the tree tops before the fear returned, or rather, caught up! It's called ground rush, it's t he moment you're close enough to identify with the distance and speed and at that moment I panicked – I don't remember being told what to do when landing… We had of course be instructed and at the last moment with a little memory nudge from the back seat driver I remembered and we touched down and slid to a graceful halt like a football players celebratory knee slide. Only we landed in a field of sheep poop and not a premier pitch..."
The 10K Session was a day long walk/jog/run with traditional Irish music being played in a number of venues along the route plus a ceili dance! Bucket collections were also held along the way in support of the event. The weather was perfect and the route just right. It was a lovely mix of warm and breezy, with beautiful scenery and some wonderful people. The music was great, and included a rare solo by Brendan Mulkere, world class violinist, and a joint tune by J Eoin and Mulkere. Paul Lane sang a heartfelt ballad at the Old Ship, and our volunteer Jack enchanted us with a unique and beautiful Irish tune at the Bulls Head. All of our Music Students were on top form, with guitars, fiddles, tin whistles and accordions filling the air! The 10K session raised over £1,600 in well needed funds, but far more importantly, it gave us traction with local and national press to get our story out there, and to showcase the dedication of all our users. 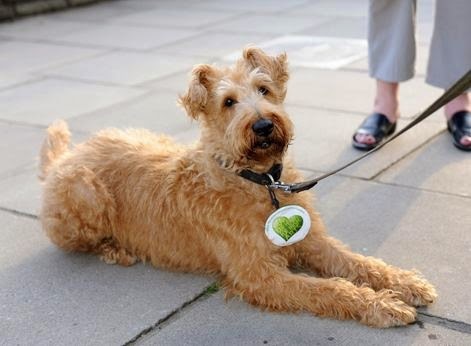 We were delighted to have Spudsy at the front of our group, with his handmade Campaign Badge! 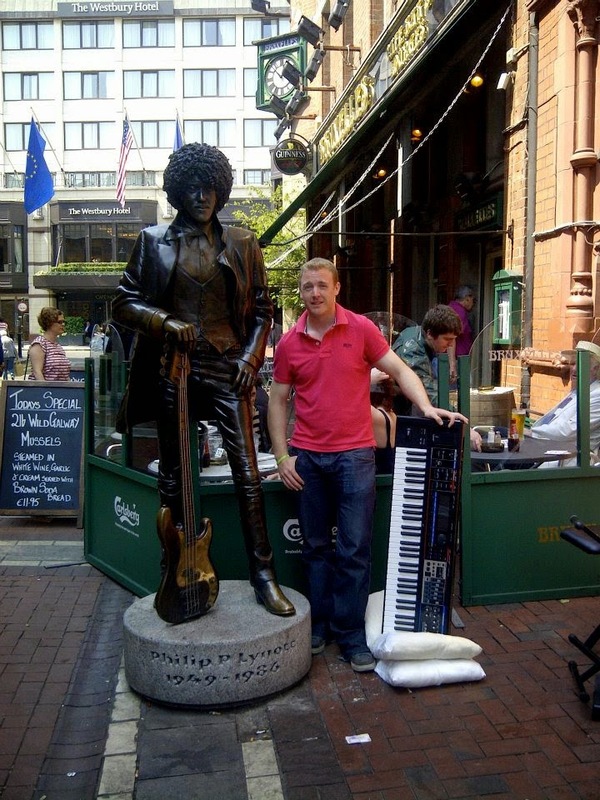 In Dublin's fair city with busking pal Phil Lynott! 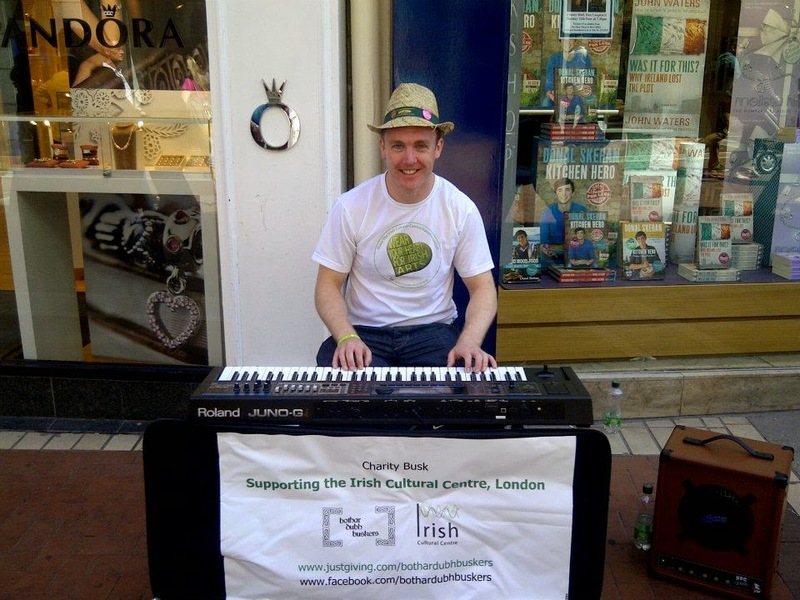 Chris Moreton, a long time supporter of The Irish Cultural Centre, embarked on a two week stint travelling around Ireland with his cousin Matt Hussey busking to fundraise for the ICC. 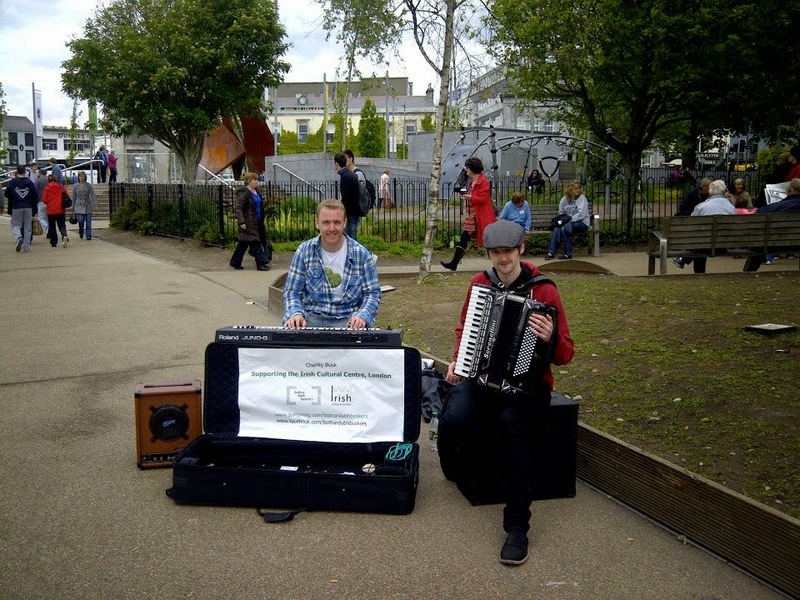 The lads travelled around the coast of Ireland armed with a keyboard, an accordion and a bucket busking in different cities and towns along their journey. From the busking they made €208, £5.27, $1 a silver button! Their Justgiving online sponsorship they made £417.68! Getting a vibe going in Eyre Sq, Galway! 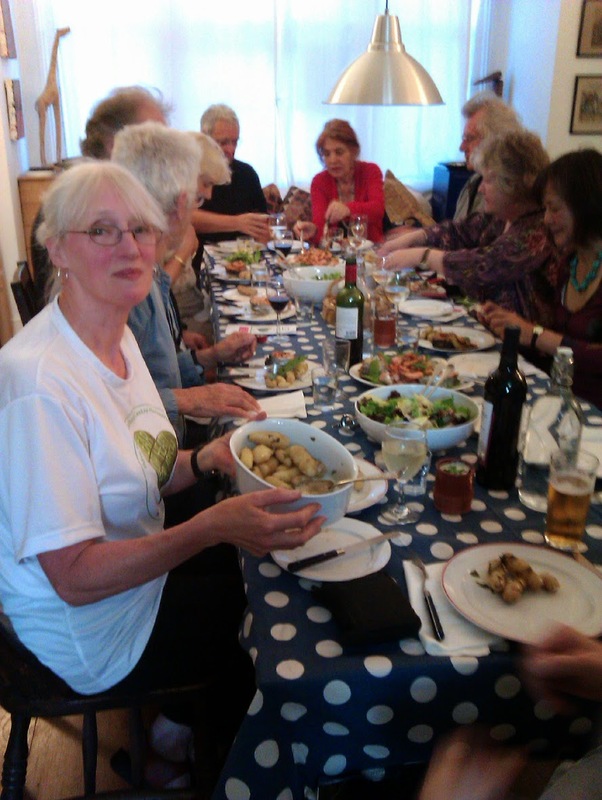 The O'Reilly family held a series of lunches and dinners for friends as fundraisers for the centre. £10 per head covered the food costs, guests brought a bottle and the extrawent straight to the campaign. The ICC also provided The O’Reillys with merchandise that they could sell to their guests. Chilly times for Headshave PJ! Our lovely long-time supporter PJ braved the razor blade and shaved his head to raise money for the ICC, raising over £300! Longtime supporters Martin and Jackie both completed a number of Marathons in our name! 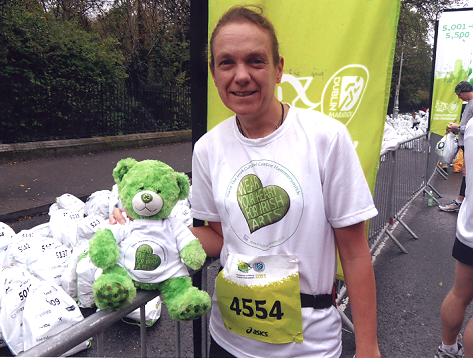 Jackie runs the Dublin Marathon for the ICC! Martin Halvey gave us his take on the Longford Marathon! "The blow of the bugle and off we went,the music from the pipe band on Longfords main street gave us a rousing send off.A mile around the town before snaking out on to the Strokestown road,a straight run of about seven miles. Almost ideal conditions except for the stiff northwest wind,the bright sun dancing behind stray clouds. The previous day I had arrived from London,accompanied by a sweet,cuddly,green bear named Begley,helping to raise funds for the Irish Cultural Centre in Hammersmith. Begley is an energetic fundraiser,passivity does not enter into his lexicon,so it was decided he would be strapped on to my back,two suit ties running through his vest and around my shoulders,secured around my back. Sunday was the first time we were to run together,so I didn't know what to expect. I hoped to run under three hours,but one never knows what is around the corner on such a long run. Begley,my old mate,was flopping and jumping all over my back, ties slipping from my shoulders,readjusting them as I ran. Eventually under gravity he settled in a comfortable position for both of us. Just crossed the Shannon near Termonbarry,the sun disappears behind a bulging black cloud.We're in for a hefty shower,and Begley when wet would put on weight to add to his seven and a half pounds. Luckily we only received a few light drops. Just gone beyond eighteen miles,and under three hours is touch and go. Legs heavy now,Begley been quiet for the last few miles,please God his battery has run out. Flop,flop the feet hit the wet road,flop flop ever onwards,one step at a time don't think about the finish what's eight more miles just put your head down and think of ........it's a long long way from Clare to here..no not that one we're on the one road maybe the wrong road...nor that when the going gets tough the tough gets going....not bad...time and the hour runs through the roughest day..Newtown Forbes,twenty miles completed,six to go. On to the dual carriageway,still hill in front,traffic snarling past. We have also had many raffles and draws held by supporters of the ICC to help us fundraise. A massive thank you to everyone out there who has supported us and helped us to fundraise for our new centre. We look forward to welcoming you to our new Irish Cultural Centre at the end of next year. Go Raibh Míle Maith Agaibh a Chairde!